Video games have been around since the 1970s, so it's unsurprising that video game characters, if they were real, would start to have mid-life crises circa 2012. 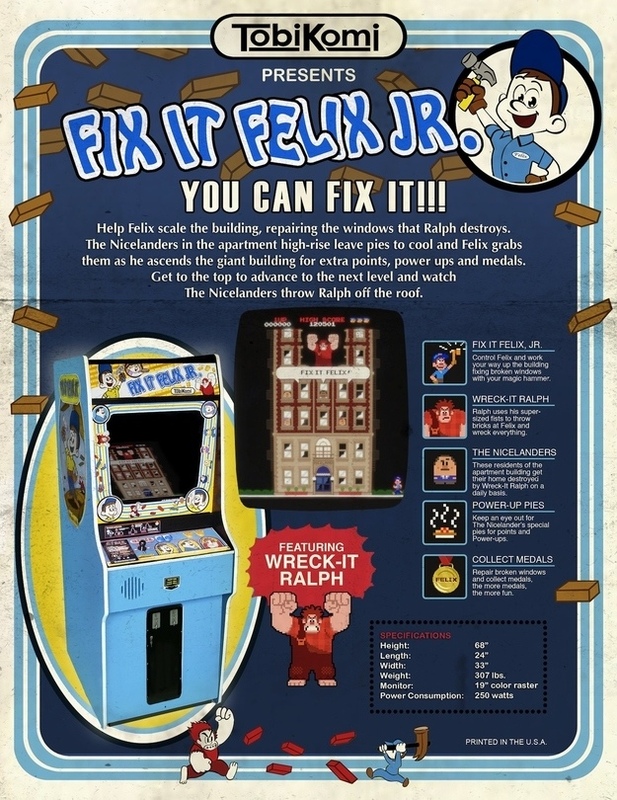 Wreck-It Ralph (John C. Reilly) is just such a character who tires of being the villain in the arcade game Fix-It Felix, Jr. As the 30th anniversary of Fix-It Felix approaches, Ralph realizes that he longs to be like the game's titular star (voiced by Jack McBrayer) who is not only loved but wins a medal at the end of every winning game. Fed up with being jeered at day after day, Ralph finally decides to win his own medal by traveling to other games once the arcade has closed for the day (video game characters can travel through power cables, and a surge protector acts as an airport of sorts). Ralph soon overhears that a new game, Hero's Duty, offers medals to victorious players and immediately heads there. This violent alien shooter quickly overwhelms Ralph, who subsequently finds himself stranded in a Candy Land themed racing game, Sugar Rush. As the arcade opens the next day, the denizens of Fix-it Felix, Jr. find themselves without a villain, and are quickly given an "out of order" sign by the arcade's owner. If Fix-it Felix (the character) doesn't find his antagonist, Fix-it Felix (the game) could be discarded in favor of a newer cabinet. 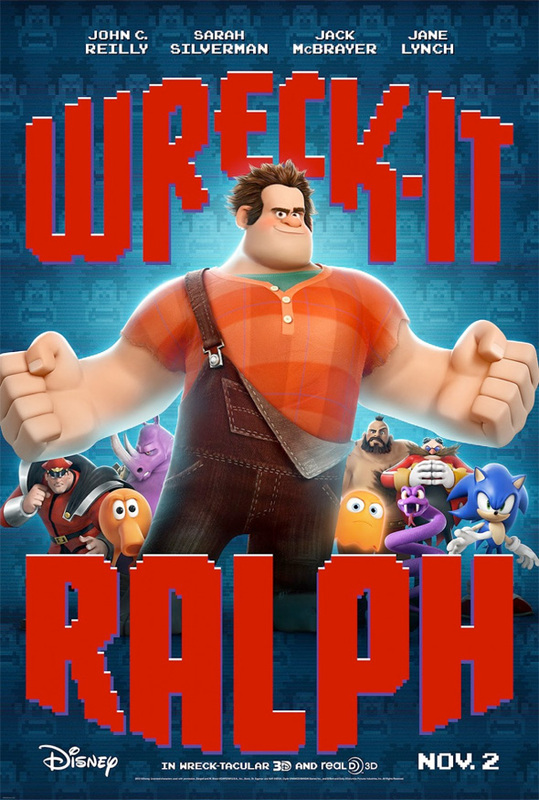 Wreck-it Ralph is joined by a space marine (Jane Lynch) and a glitchy, unused racer from Sugar Rush (Sarah Silverman) in his quest to finally become a hero. Wreck-It Ralph (the movie) bears more than a passing similarity to the Toy Story franchise. Characters in both series are playthings that come alive when children are not around and fear being replaced by newcomers on the scene. Wreck-It Ralph is much more lighthearted than those films, and doesn't have quite the same level of pathos that Woody and the gang do. The storytelling is a tad uneven in Wreck-It Ralph, occasionally dragging during its almost episodic segments. Like the Toy Story movies, themes here include friendship and working together and Wreck-It Ralph is mostly appropriate for kids. The Hero's Duty segment might be scary for very young audience members, but any viewer who has seen a sibling play Halo - or worse - is probably safe. Wreck-It Ralph is a fun, breezy film and video game fanatics will enjoy catching all of the retro gaming references. Brightly colored and good-natured, Ralph is a seemingly appropriate film for most kids and is also interesting enough to keep parents involved, especially those parents are gamers raising a second generation of video game fanatics. While Wreck-it Ralph may not be in the upper echelon of GREAT children's movies, it's still a lot of fun and is far from the bottom feeders of children's programming.